Washington: Charles Howell snapped an 11-year US PGA Tour win drought on Sunday in epic fashion, sinking a 20-foot birdie putt on the second playoff hole to capture the RSM Classic. The 39-year-old American had not won since Riviera in 2007 — a gap of 4,291 days — and had lost four of five prior playoffs before conquering compatriot Patrick Rodgers to win at Sea Island, Georgia. “I just don’t even know (how I did it). 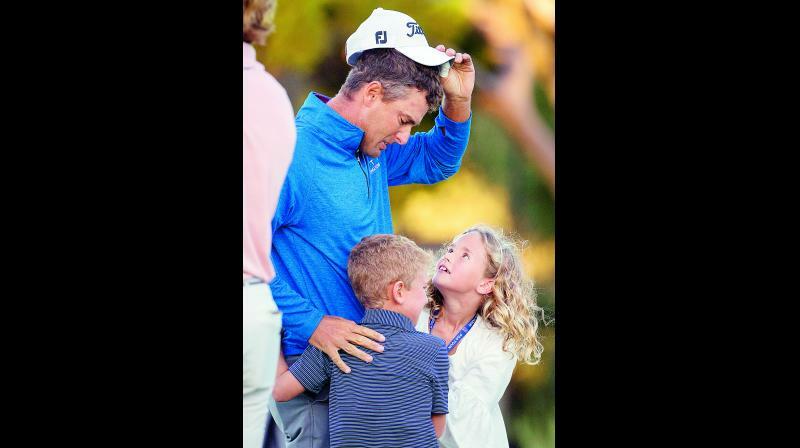 I haven’t been able to pull it off in so long,” Howell said before breaking down in tears. Squandering his lead with a bogey-double bogey start, Howell battled back all day to match Rodgers, whose 61-62 weekend nearly took him to his first PGA title. “To hang in there and turn it around, I needed some good fortune on my side and fortunately I had it,” Howell said. “I’ve failed a lot of times. It was different today,” he added. Howell also secured a berth in his hometown event — next year’s Masters at Augusta, Georgia — for the first time since 2012 by ending his drought after 333 events and 1,154 rounds. It was third time charmed for Howell, who had three birdie putts on the 18th hole of the Seaside course to win the title, the first in the last round and the second on the first playoff hole before his sank the last. Rodgers ‘gutted’ Rodgers, 26, matched his career-best PGA finish with the runner-up effort after failing in his first PGA playoff. “It has been such a long building process the past year and a half. All the hard work paid off with how well I played this week,” Rodgers said.